To reduce micronutrient deficiencies in the Canadian population, several staple foods such as bread, flour and salt are required to be fortified with a variety of vitamins and minerals. This is referred to as mandatory fortification, and is done to replace nutrients lost during manufacturing, to act as a public health intervention, to ensure nutritional equivalence in substitute foods, or to ensure proper nutrient composition in foods for special dietary purposes. Due to demand for a wider variety of foods for consumers to obtain adequate vitamin and mineral intakes in a day, some countries including the U.S. have moved to a broader level of fortification, referred to as voluntary or discretionary fortification. While this allows consumers more choice in foods to achieve adequate levels of nutrients, it also creates the potential for over consumption of nutrients that may lead to adverse effects. 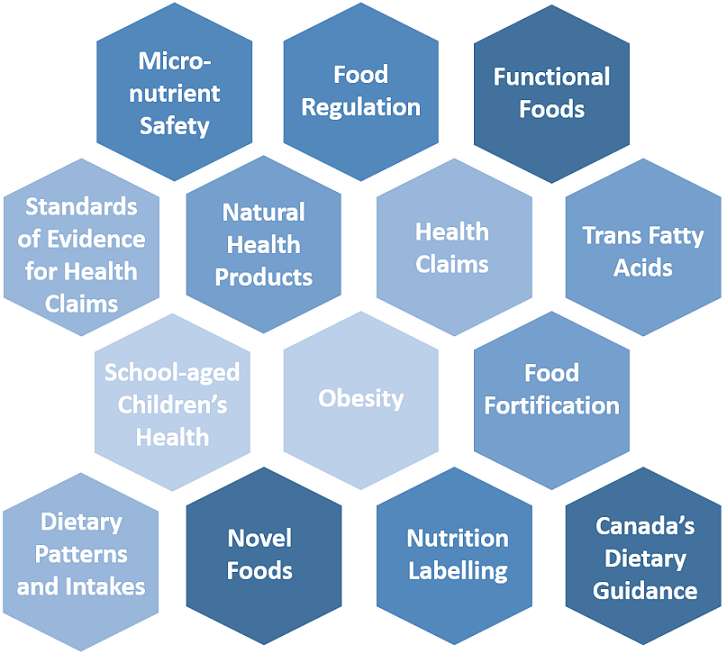 There is a need for more research in the area of voluntary/discretionary food fortification in Canada, and modernization of the Food and Drug Regulations. Currently in Canada some food products fortified with vitamins and minerals reached the market through the Natural Health Product (NHP) directorate. Because these products are viewed and consumed as foods, they are currently being moved to and regulated under the Food Directorate, which had strict rules for what foods can be fortified and at what level. To accommodate these foods and determine if they are safe on the market, Health Canada has created a new category of foods called ‘Supplemented Foods’ and is allowing sale of these products for a finite period of time to gather data and inform final regulations. The PFSNRA has hosted several meetings with Health Canada to identify research gaps in moving forward with supplemented foods and broader fortification regulations and acts as a conduit to connect industry, researchers and government on the issue. For more information on Health Canada's proposed guidance for the new catergory of supplemented foods, please visit the Health Canada website. Proteins are important and complex molecules made up of specific sequences of amino acids that serve countless roles in the human body. Proteins vary greatly in terms of source (animal or plant), composition and amino acid sequence, and ability to be digested. Humans have minimum protein requirements in order to support growth and optimize health, and these are based not only on amount (quantity) of protein but also on the quality of that protein (contain essential amino acids, easily digestible). Canada and other countries around the world therefore assess the quality of proteins in foods. Currently Canada uses the Protein Efficiency Ratio (PER) method which determines quality based on the ability to support growth in rats. With advances in science several other methods have emerged including the Protein Digestibility-Corrected Amino Acid Score (PDCAAS) method currently used in the U.S. and the newer Digestible Indispensable Amino Acid Score (DIAAS) method. The availability of different protein quality assessment methods has led to debate among scientists about accuracy and feasibility, and also has caused discrepancies in the methods used by regulatory bodies (i.e. Canada using PER, U.S. using PDCAAS). The PFSNRA is interested in assessing the different protein quality assessment methods from the standpoint of scientific accuracy but also feasibility in regulation and use in industry, and creating North American and ideally global harmonization in methods used. Currently the PFSNRA is planning to co-host a workshop in November 2016 with Health Canada and protein researcher James House (University of Manitoba) to bring together North American protein scientists, regulatory bodies and industries to discuss knowledge gaps and opportunities. In October 2013 the Canadian government made a commitment to assess and improve the information provided on food and nutrition labels, launched from a Speech from the Throne by His Excellency the Right Honourable David Johnson, Governor General of Canada. Beginning in 2014 Health Canada and the Canadian Food Inspection Agency began consultations with Canadian parents and consumers via in-person round table discussions and online surveys, leading to the publishing of the ‘What We Heard Report’ highlighting what consumers currently understand on the food label, and what they want improved. In the summer of 2014 Health Canada published the initial proposal for changes to food labels, and accepted feedback from stakeholders and the public. The PFSNRA submitted a report at this time to Health Canada highlighting the scientific support and criticisms of their proposed changes, which can be accessed here. After evaluating comments, Health Canada adjusted the proposed food label changes and published the revised proposal in Canada Gazette Part 1 in June 2015, launching a 60 day period for stakeholder and public feedback. The PFSNRA again submitted a report to Health Canada on the scientific evidence related to their food label changes. Our report can be found here. The PFSNRA also worked with the International Life Sciences Institute – North America branch to submit comments to Health Canada related to changes to sugars and fibre labelling. Currently Health Canada is evaluating the feedback and aims to publish the final amendments to the Food and Drug Regulation in Canada Gazette Part 2 by the end of 2016. While Health Canada was modernizing their food label, the Food and Drug Administration in the U.S. was also proposing changes to their label. More information on their process and the final changes to the food label published in the Federal Register on May 27, 2016 can be found on the FDA website .